Whether you are looking for complete relaxation and tranquility, or thrills and excitement, Otaki Beach is the place to find it. Just take a 3 minute stroll from Byron’s Resort and you’re on the windswept sand dunes. Dig your toes in the warm sand and gaze along this stretch of beautiful coastline. Sunsets here are just stunning, when you stay with us, make sure you include a sunset glass of wine or fish and chips at dusk on the beach. Keen surfers (especially long boarders) will find Otaki and nearby beaches a West Coast treat. Pack a picnic and spend the day, watching the kids enjoying all that nature has to offer – swimming, sand-castle building, shell collecting – as you relax into a good book or just lie about in the sun. Enjoy a romantic or relaxing stroll along the beach, or bring your long-line and discover the bounty of fishing on the West Coast. Then you can bring your fresh Red Cod or Snapper back to Byron’s Resort and cook it on the BBQ! 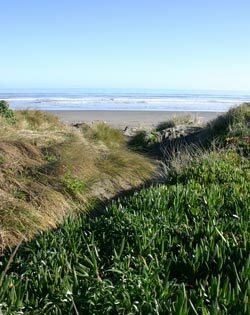 Leisurely or lively – Otaki Beach is the destination. 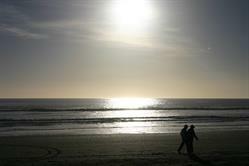 The Nature Coast of New Zealand, of which Otaki is a part, is miles upon miles of excellent beaches. Drive any short distance north or south and you’ll discover another spot to swim, surf, picnic or explore.